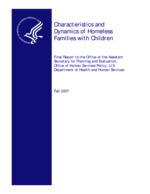 1 U.S. Department of Health and Human Services. For the purposes of some Federal definitions, being doubled up is considered homelessness whereas in other programs it is not. 2 Reingold and Fertig also conducted analyses on the Fragile Families data set for Appendix D in this volume (Reingold and Fertig, 2006) in response to a request to write a paper on at-risk families. Their paper was designed to examine homelessness among poor families with children while this chapter, derived from our exploration of relevant secondary data sets, looks more broadly at the different residential histories of poor women (50% or below the poverty level) and the factors that predict both homelessness and stability. Where the analyses overlap, similar results are found in both studies. 3 More detailed information on the Fragile Families data set can be found in Reichman et al. (Reichman, Teitler, Garfinkel, and McLanahan, 2001), as well as on the study's web site. 4 More specifically, the backward stepwise procedure removed non-significant variables one-by-one. Once all appropriate variables had been removed, however, the program re-examines all of the removed variables to see if any should be re-entered. 5 The outcome tables show all of the variables that were initially included in the model (nonshaded parameters), but parameter estimates are shown only for those variables used in the final model. 6 An interesting observation is that homelessness in this sample does not appear to be completely correlated with poverty. A total of 230 families (5% of the total sample) experienced homelessness at some point during the followup period; only one-third of these families were living at 50 percent of or below the poverty level and 29 percent were living above the poverty level. Additional analyses of these groups may provide further insights into the factors related to families becoming homeless.